Hippity Hoppity into the Easter holiday. This adorable baby bunny has a pink bow and a pink diaper on. 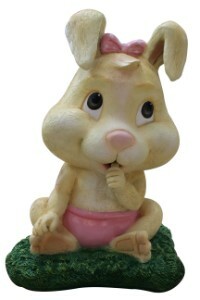 She is 11" and made of polyresin.Children of all ages will love these bunnies, they are ear-resistible.